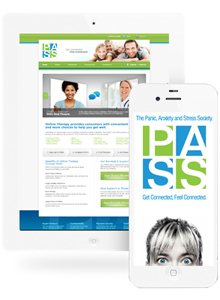 PASS (Panic Anxiety Stress Society) approached us with quite a unique problem that they needed to solve: they would like to develop a brand new site to provide their users with online therapy. The twist? PASS wanted to integrate a real-time video chat on their site so one could “sit face-to-face” in front of their chosen therapist for their session. It was a quite a unique build and a fun project to work on. Red Cherry put together a full-scale branding package whereby we included logo design, a brand new website, backend software and a custom social network for PASS. We enabled messaging and a real-time video chat function using the latest HTML5 technologies. Furthermore, the PASS site incorporated a file-sharing utility, messaging as well as a custom-integrated Ecommerce payment system with full PCI compliance (no credit card information was stored online). Red Cherry solved PASS’s challenge on how to build an online entity to match qualified therapists online with users who prefer to get counseling from the comfort and privacy of their own home. Full branding from messaging, logo, website, software and coffee cups. Real-time HTML 5 video chat works off paid credits with real-time messaging and file sharing. Users can select from many different therapists and are matched or can choose their therapist. Clean and clear top level messaging for home page. Get connected. Feel connected.